Rice Krispie Treats are so sturdy … had to do something a little different … stood it up on its side! If you have watched any of the cake competition shows on TV, you know how often Krispie Treats are used in the construction of amazing cakes. I really wanted someone to say “Wow, how did you do that”? Instead, this is what I got … “did you already take photos and can we eat it?” and “oh, it’s a strawberry, now I see it”. I amazed myself … didn’t even whimper or bang my head against the wall! What can I say … men! Do you remember a few weeks ago, when I made the Cookie Lover’s Chocolate Bark … comments were left about all the uses for cake pans? I always call them cake pans, but know that some people call them cake molds. 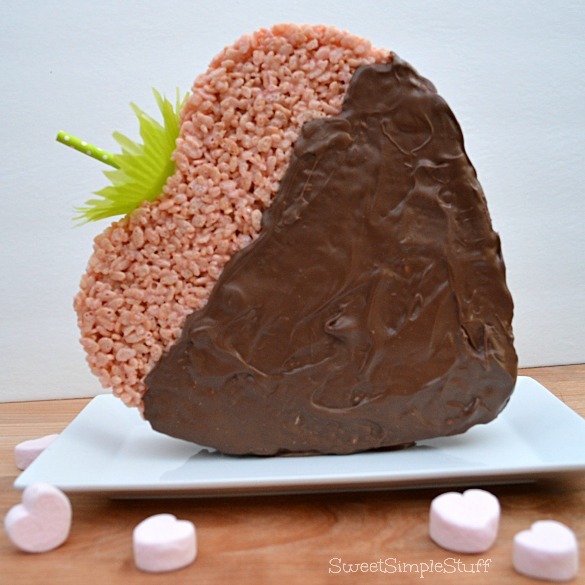 Maybe I should change … use a pan to mold Rice Krispie Treats! 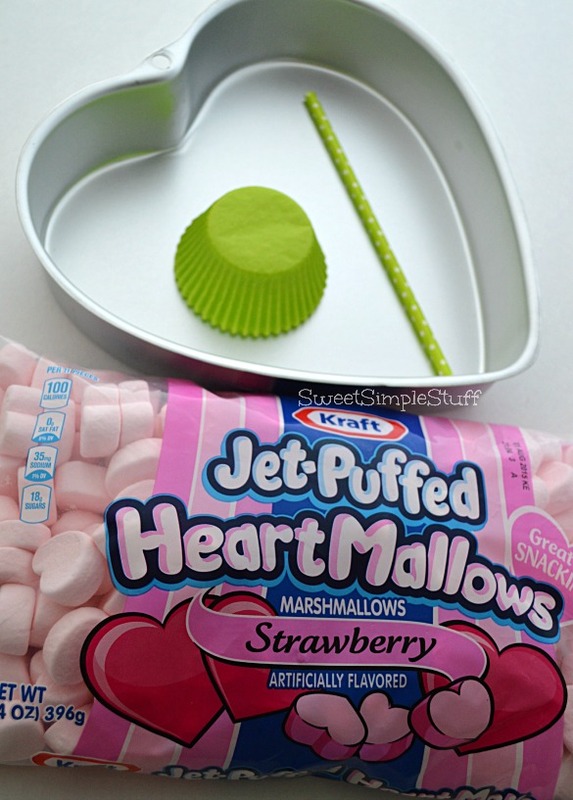 Hint: if you can’t find these marshmallows, try substituting mini-marshmallows, then add pink food coloring and strawberry flavoring to the melted marshmallow mixture. Grease pan and a spatula with butter, set aside. In a large pot (6 quart), melt 6 tablespoons butter, add marshmallows and allow to melt while stirring frequently. Turn heat off and add Rice Krispies, stirring to coat all cereal in marshmallow mixture. Scoop into prepared pan and use buttered spatula to press/smash into pan until leveled. Immediately turn pan over on wax paper or parchment paper. Remove pan. Let Rice Krispie Treats cool and firm up, about 1 hour. While you are waiting for the Rice Krispie Treat to harden up … Use scissors to cut a small “x” in the center of each cupcake paper and snip edges to resemble leaves. Cut straw in half (you will only use 1/2). Melt chocolate according to directions on package. 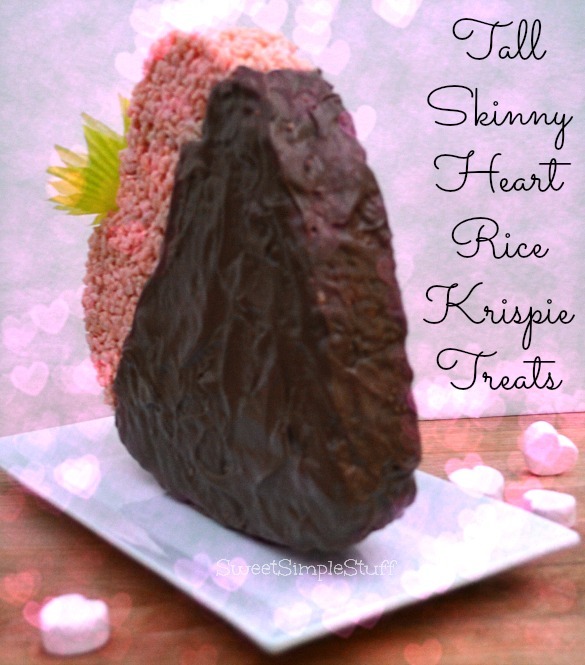 Spread melted chocolate (like icing) on top and sides of heart-shaped Rice Krispie Treat to resemble chocolate dipped strawberry. Chill for a few minutes to let chocolate harden. Turn the heart over and repeat step #6. Chill. Insert straw thru holes in cupcake papers then into heart, to resemble leaves and a stem. Check out that first photo above … my first reaction … “Oh crap, it’s not gonna fit!” All I can say is … smash it, smash like you mean it … it fits! The Rice Krispie Treats are firm, but the harden chocolate adds even more stability to it! After this was all done and half eaten, I had second thoughts … should have drizzled a little white chocolate over the milk chocolate … like they do on fancy chocolate dipped strawberries or maybe drizzled chocolate on the plate … like fancy desserts at restaurants. If you decide to fancy it up … please send me a photo at sweetsimplestuff@hotmail.com! My car saga, part 3, final episode … the hubby knows cars … tested the battery … weak and just about three years old … took car to a different garage, just to verify … bought a new battery … problem solved! Are you making or baking something special for Valentine’s Day? You are just too creative which I certainly admire. Keep those great ideas coming! This is so much fun. It would make a great gift or a super snack for a Valentine’s Day party. 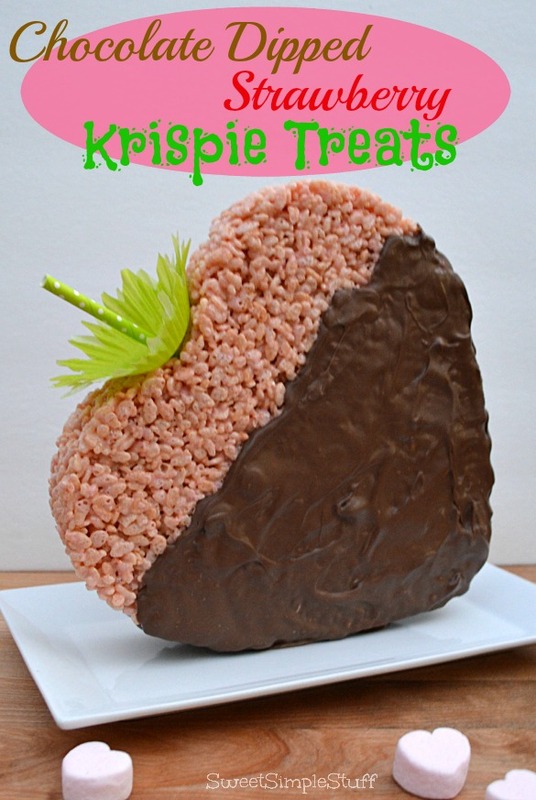 Oh, a girl after my own heart; chocolate dipped krispie treat strawberry. That has to be the largest strawberry I have seen. :} What a great idea by using your heart pan. Just think how sweet it would be using your heart shaped pan in making a heart shaped block of fudge or a large heart shaped chocolate chip cookie.